In A Fraction Of The Space? From Your Own Garden, Even If You Live In An Apartment! Are you one of the many folks who long for fresh, crisp, homegrown garden produce like you used to harvest, but are stuck paying through the nose for tasteless produce from the grocery? Im sure youve noticed the shrinking backyard trend. Decades ago, most everyone had enough space for a decent backyard garden. Today, subdivisions crowd homes so close, you can almost hear your neighbors toilet flush. Finally, theres a system that allows you to grow all the fresh vegetables and berries your family desires, with plenty to share with neighbors and even extra for winter storage! And you dont have to own prime farmland to do it! In fact, you dont even need to have a sprawling backyard. The vertical gardening trend is a gardeners dream come true! Whether you want to raise a harvest in the city or country, growing up is the way to go! Imagine the fun of picking bushels of veggies without tilling, weeding, or stooping! Without dealing with cutworms and grubs and slugs! While theres nothing like farm life, in my opinion, plowing a huge garden year after year gets real old, real fast! Then youre totally dependent on Mother Nature to shower your plants with plenty of water. Have a few dry weeks, and you could totally lose an entire crop. No wonder garden lovers everywhere are trying vertical gardening. You can reap a huge harvest from a tiny space. And even city transplants can grow their own veggies, thanks to growing up! Im Janet Combs, and have been gardening since I was knee high to a grasshopper. I remember winning bean picking contests at the age of three (though I think my grandma let me win) and planting, weeding and harvesting everything from tomatoes to corn to turnips to gourds throughout my life. In my opinion, theres no better place to be but outdoors, playing in the dirt! After my grandfather passed away, we sold the farm. I must admit, where we moved to is limestone city. Add clay soil on top of that and youve got a mess to try to plow up. After repeated attempts to grow vegetables, my expert gardener grandmother threw in the towel and declared no one could grow a garden on this property it was solid rock. While it wasnt possible to plow the land for a garden, we eventually discovered vertical gardening techniques. Thankfully, by growing up, we could glean a good harvest! Thats when the addiction began. After viewing how much we could grow in a small area, I was on a mission to finding every way to harvest the largest amount of produce from the smallest space possible. Vertical Gardening can be highly addictive! I am convinced that once you see how easy it is to grow vegetables and fruits with little green space, youll never stop! Year after year, youll find new ways to garden vertically. Im totally hooked. And Id like to share the fun of vertical gardening with you, too! Its why I put together this package called Vertical Gardening Secrets. * The cheapest ways to garden up: no need to spend mega-bucks from garden catalogs when you can put these supports together for a few bucks! * Secrets to getting more than one harvest from the same square inch! * Vertical gardening with containers; no digging, no weeding, no sweat! And Id like to offer the entire package to you for a mere $14.97. money, no questions asked - and you can keep the bonus reports absolutely free. Hows that sound for a risk-free deal? If you love to grow your own produce, you owe it to yourself to discover the easiest ways to get mega-harvests from your green space- no matter how small! 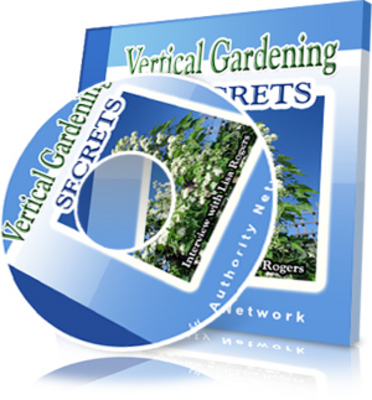 Click the order link to get Vertical Gardening Secrets Now! P.S. Remember, there is absolutely no risk to you whatsoever. If youre not thrilled with your Vertical Gardening Secrets Package, every penny will be refunded no questions asked! P.P.S. Finally, you can reap a mega-harvest even if you have no backyard! Imagine all the homegrown taste - without all the work!